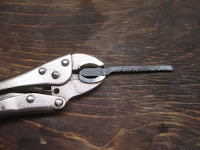 I have been hunting around the Internet looking for good tutorials on how to assemble hidden tang handle and it's been hit or miss. Through trial and error I have found some methods and wanted to share them here. In it's simplest form a hidden tang the handle need only have a block of wood and some careful fitting. The next logical step in handle construction is to add a pin to mechanically secure the handle to the tang. 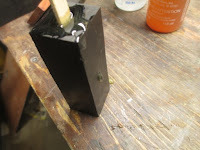 For this example, I've made it a multiple piece handle with the main components being a bolster, block and pin. 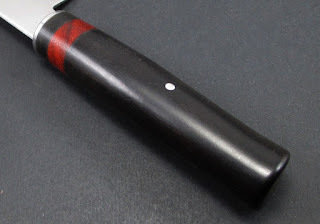 An optional bolster (shown as red in the graphic) is slotted and slides up the tang to rest tight on the shoulders where the ricasso or neck if the blade is. 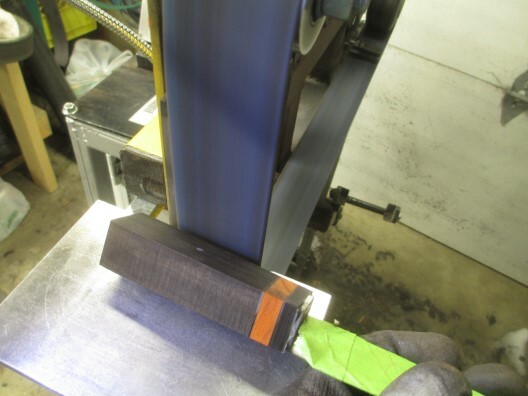 This bolster protects the end grain of the wooden block that goes next to it. 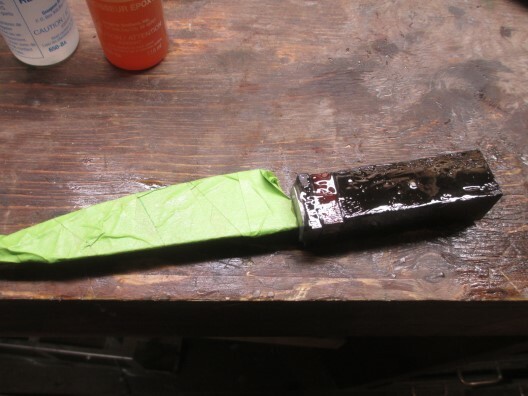 It can be a guard which extends further away from the tang than the rest of the handle and prevents your hand from slipping off the handle toward the blade. The bolster or guard has to be slotted very carefully. Normally, I drill a series of small holes in a straight line and then join these into a slot with a needle file. Typically the holes are 3/32" and the slot is widened to around 1/8". 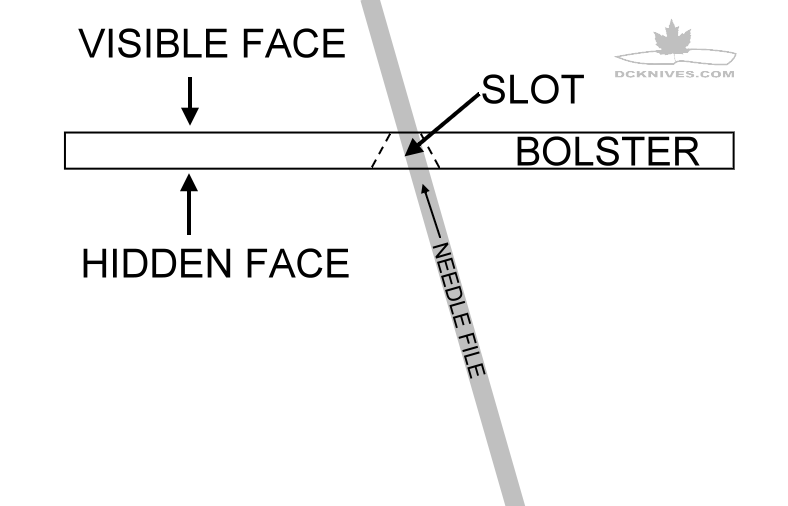 The slot width needs to be a few thousandths smaller than the shoulder so the taper in the shoulder hides the slot when assembled. Start the holes in a nice straight line with a punch. Leave about 1/32" between the drilled holes. Otherwise the bit may want to slip into the adjacent hole. 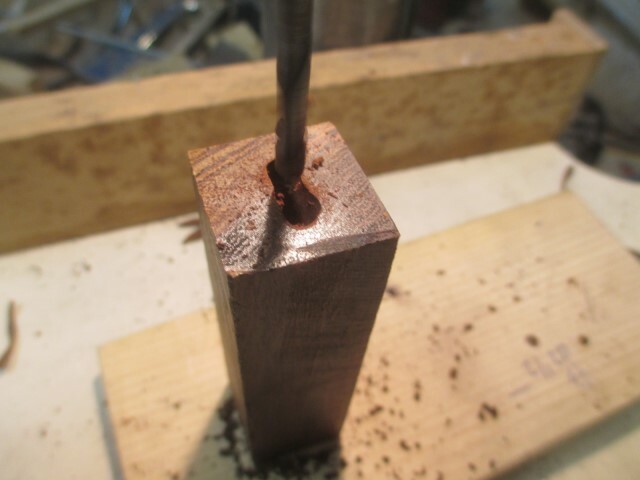 If it starts to slide, very carefully drill from the opposite side. 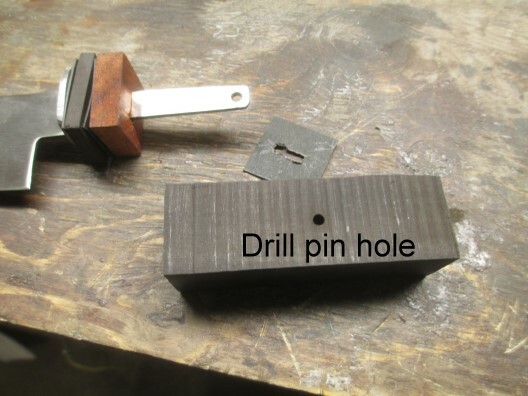 You'll want to mark and punch that too before drilling. Only one face of the bolster will be seen. The backside will be hidden, so we only need to perfect the one side. 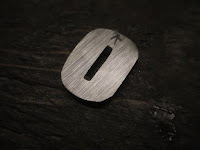 You can taper the slot at the backside and focus on less material at the opening on the visible face. Here I am filing the slot. Note that I have kept the bolster as part of its original scrap piece. 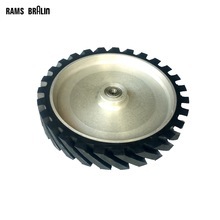 This makes it easier to hold on to when filing and buffing. Also note that I have marked the top so that I get the tang going into the slot the right way. Testing the fit and filing a little more. This takes patience but pays off when there are no gaps showing when the shoulders come to meet the bolster. 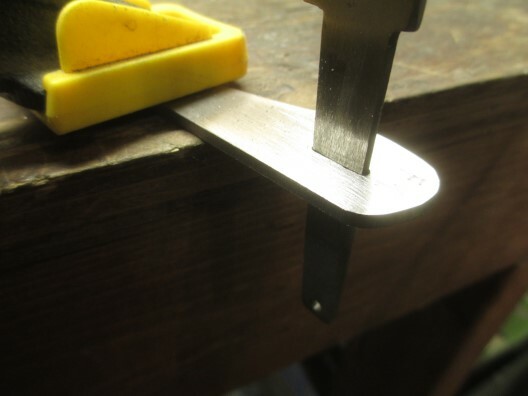 I like to get the fit about 90% of the way then tape up the blade and clamp it in the vise between two pieces of wood. Slip the bolster on the tang. 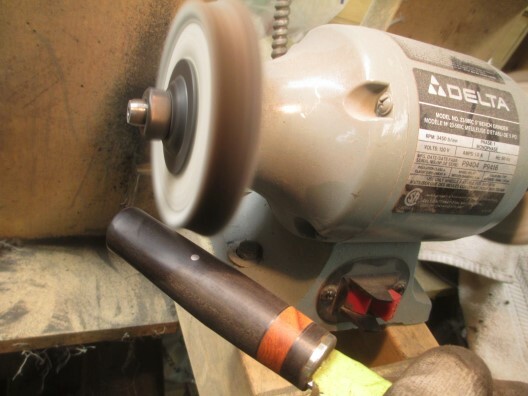 Then using a piece of pipe over the tang, tap gently until the bolster is "pressed" on to the tang right up to the shoulders. 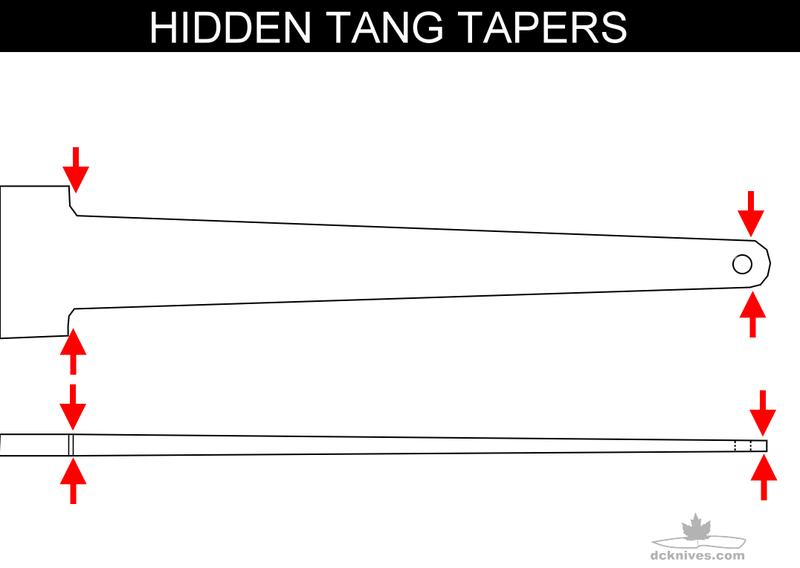 In order for a bolster or guard to fit tight to the tang, then tang must be tapered in two dimensions. It will need to be thicker at the shoulders and tapers to the rear. This way any bolster or guard slot can be shaped perfectly to fit the shoulders. 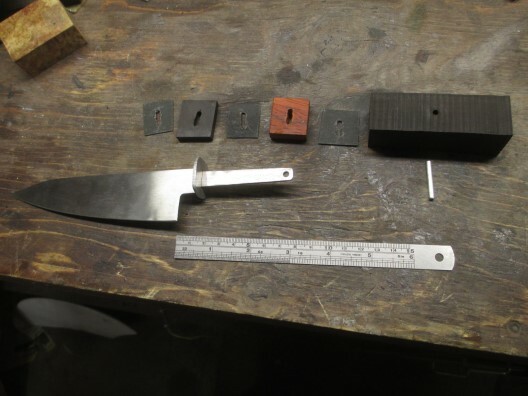 The block is slotted and the tang is fitted inside the block. 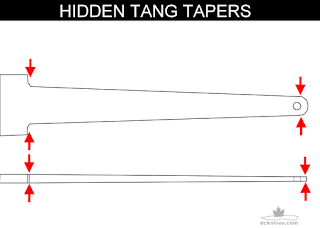 A handy rule is that the tang must go into the block more than half way. 75% is better. The photo shows the slotting of the block to accept the tang. Slotting the block is not as super-critical as slotting the bolster was as this end will be unseen. A drill press is handy for this. I usually make three holes in a line. The middle hole goes deeper than the two outside holes. The hole size is slightly larger then the tang is thick; around 1/8"to 3/16" for most knives I make. The slot is never perfect off the drill press. Sometimes you need to wiggle the drill and enlarge the inside of the slot. This doesn't have fit perfectly, but it should be snug when the tang is pressed all the way in. 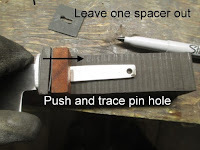 One trick is to use a broach to gouge out the slot. 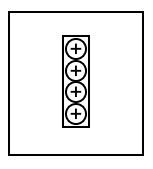 Most of the blocks I use are a minimum of 1" x 1" x 4-1/2" long. Woods like cocobolo (shown) make excellent kitchen knife handles because they are hard, oily and quite resistant to moisture common in the kitchen environment. 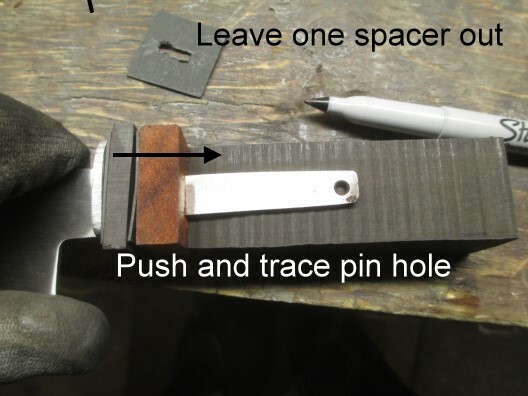 One trick to ensure the fit is tight is to mark the hole with a spacer missing. 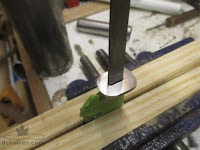 Then adding the spacer after the hole is drilled will force a tight fit. 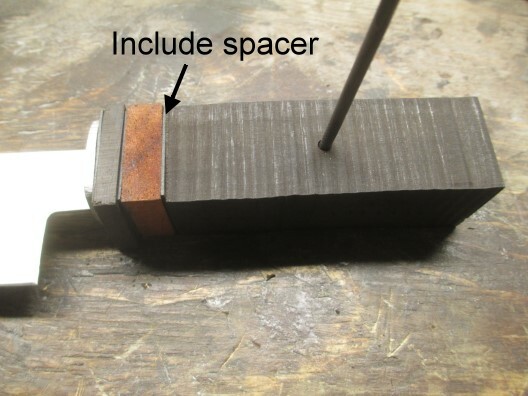 Of course the spacer must be thin and chamfering the pin will allow it to get started in the hole and "pull" the components together. Here I have left one spacer out. I'll push the tang and components right tight and mark the hole with the fine sharpie. I drill the hole in the drill press. The hole size is exactly the pin size. 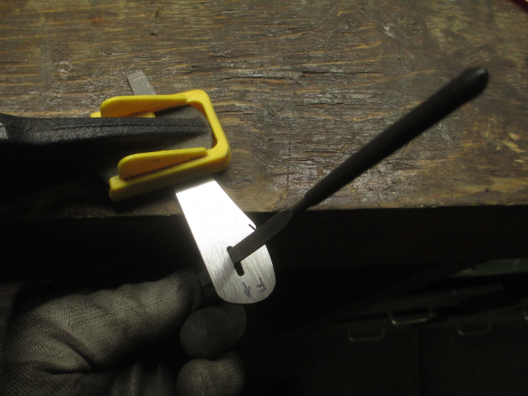 Here I am checking the fit by inserting a tapered round file. This should squeeze all the pieces together. If it's super hard to press a pin through there are two things to try. 1) using a burr or diamond bit elongate the tang hole or 2) very carefully remove some material from the front end of the block. I prefer to elongate the hole. The stack of components is laid out prior to mixing the epoxy. 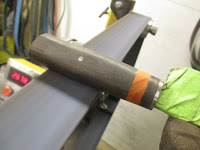 At this point you may want to tape up the blade right close to the ferrule. It will save you have to clean the epoxy off the blade later. Don some disposable gloves and mix up about 10 ml (2 tsp) of quality epoxy. Using a Popsicle stick, spread it between each piece. Cover all surfaces. Fill the hole in the block. This should ooze out the pin hole. Don't be afraid of over filling. If it squeezes out, then you know you have enough. This is a great mess, but it gets better. Place on some waxed paper and keep warm until the epoxy is good and hard. Now you can start squaring the handle. Once squared, I start the rounding process. Rounding is easy on the slack portion of the belt. Rotating the handle and applying even pressure creates a nice round. Keep a water bucket handy and keep the ferrule cool. Too much heat will burn the epoxy. 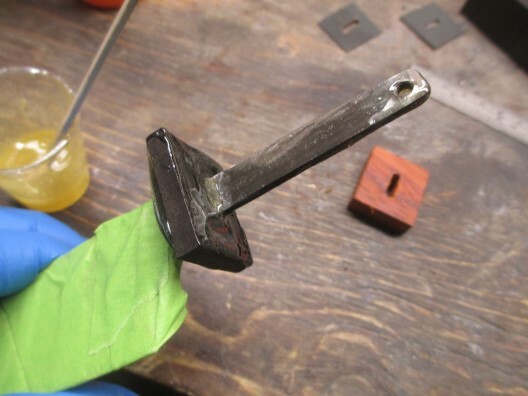 Change belts as you get close to the final shape, ending up around 400 grit. Now over to the buffing wheel to add some shine.